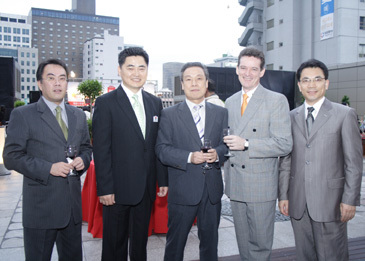 Mr. Bruce Lee, general manager of Ibis Ambassador Myeong-dong, poses with other dignitaries of the hotel group. Ibis Ambassador Myeong-dong, the second Ibis brand hotel in Seoul, successfully held its 1st anniversary ceremony on May 18, 2007. Hosted by the general manager, Mr. Bruce Lee, the ceremony was to celebrate the hotel's successful first year and participated by major contractors, staffs and executives from Accor-Ambassador hotels and guests who have been a solid support to the new Ibis hotel in the heart of Myeong-dong, the mainstream for business and shopping in Seoul. The anniversary party, held with a standing buffet at the outdoor garden terrace on 7F, was celebrated by a 3-person staff band that backed up the party with a harmony of keyboard and flute, which was followed by the African folk performance to make the night more entertaining with their exotic folk dance & music showdown. Also celebrating at the ceremony were the president of Ibis Ambassador Myeong-dong, Mr. Myung-geon Joo and the general managers of Accor-Ambassador hotels including Mr. Jerome Stubert from Novotel Ambassador Gangnam, Rodney Trutwein from Novotel Ambassador Doksan and Mr. Soo-young Chung from Ibis Ambassador Seoul. At the end of party, celebrating gifts were drawn to be given to over 30 hotel guests who were present at the party. "Tonight's celebration couldn't be made without strong supports from our guests who chose Ibis Myeong-dong. We opened our doors in one of the most competitive areas in town and the achievement we made during the first year is amazing. So, tonight, we are celebrating our first anniversary and also showing our deepest appreciation to everyone that supported us. Ibis Myeong-dong will continuously provide our guests with "Money for Value" and work our best to stay with our guests' said Mr. Bruce Lee, the general manager. Ibis Ambassador Myeong-dong is the fourth joint venture between Accor and Ambassadors. The hotel opened its doors in May 2006 in Myeong-dong, the mainstream for luxury hotels and quickly positioned itself as the favorite choice for economy hotel with over 80% of occupancy rate. Along with its sister hotel, Ibis Seoul, the new Ibis hotel in Myeong-dong has certainly started its success business in Korea.